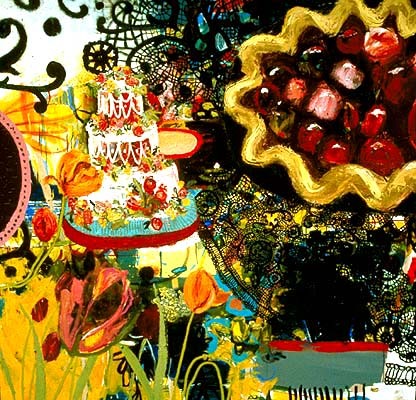 Clifford  Smith Gallery is pleased to announce its January exhibition of paintings by Tracy Miller. There will be a reception for the artist on Friday, January 4th from 5:30 - 7:30pm. 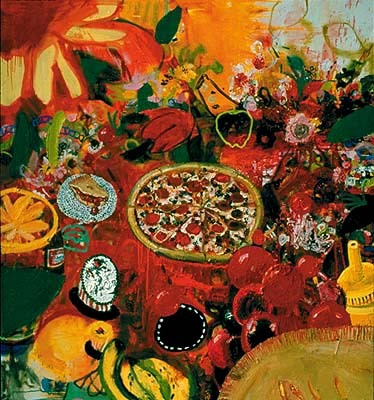 .Tracy Miller's paintings are jubilant still lifes crammed with junk food, cookies, beer cans and doilies. Floral motifs bounce from tulips to lace to fluted tart crusts. 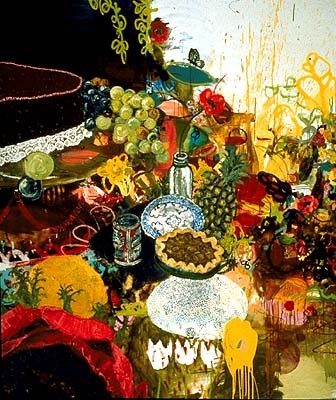 The paintings are "hot" chock-full of cranberries, lobsters, bananas and succulent fruits, the application of the paint acting as metaphor for the sensuality of food itself. In an inversion of the classic Kandinskian accident, Miller's process begins with a freewheeling abstraction, rotated and repainted over a period of a year or more until representational imagery begins to appear. Eventually, the painting develops an orientation, but not before a lovingly absurd scene of wedding cakes, donuts and guilty goodies have taken their place next to each other. Miller is astutely rifling through the history of still life painting and firmly replanting it in the context of contemporary culture. Here she achieves her greatest success: a reverential look at the goofiness of our obsessive/repulsive attitudes toward crappy food. Originally from Iowa, Miller understands the midwestern tradition of covered dish dinners and Sunday suppers, replete with an overload of sweets and affection expressed through food.